Our next litter is due February 22, large litter confirmed by ultrasound. The sire is BISS GCH Chestnut Hills Windjammer SH WDX "Jesse". The dam is our girl Sadie. We will have a second breeding late spring/early summer 2019 out of Derby. Please contact us for more details. BISS GCH Chestnut Hills Windjammer SH WDX "Jesse" X Barrel Select's Chateaux Lafleur JH WD "Sadie"
Confirmed by Ultrasound, currently accepting applications. Please email us at info@barrelselectchesapeakes.com for more information. We are very excited about this upcoming breeding between Jesse and Sadie. Both dogs are very well balanced and athletic. To learn more about Sadie, please visit her page under our Females. We were fortunate enough to get to see Jesse in person over the summer and were very impressed by his movement and demeanor. 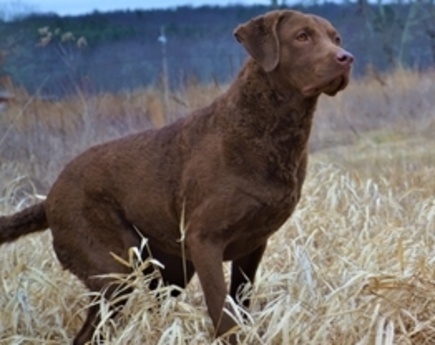 We expect well tempered and athletic dogs that will be suitable for hunting, performance, show, or companion homes. Please contact us for more information. More pictures of Jesse below.